In recent years street art has grown bolder, more ornate, more sophisticated and—in many cases — more acceptable. Yet unsanctioned public art remains the problem child of cultural expression, the last outlaw of visual disciplines. It has also become a global phenomenon of the 21st century. 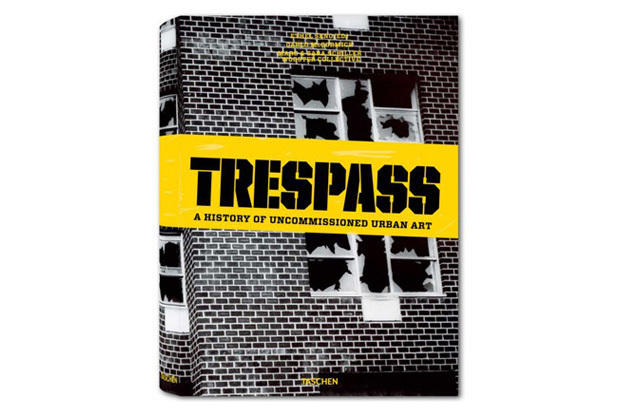 Made in collaboration with featured artists, Trespass examines the rise and global reach of graffiti and urban art, tracing key figures, events and movements of self-expression in the city's social space, and the history of urban reclamation, protest, and illicit performance. The first book to present the full historical sweep, global reach and technical developments of the street art movement, Trespass features key works by 150 artists, and connects four generations of visionary outlaws including Jean Tinguely, Spencer Tunick, Keith Haring, Os Gemeos, Jenny Holzer, Barry McGee, Gordon Matta-Clark, Shepard Fairey, Blu, Billboard Liberation Front, Guerrilla Girls and Banksy, among others. It also includes dozens of previously unpublished photographs of long-lost works and legendary, ephemeral urban artworks. Marc and Sara Schiller founded Wooster Collective in 2001, a website that celebrates and plays a crucial role in documenting otherwise ephemeral street art. Based in New York City, the collective curated most of the contemporary images in Trespass. Its "Wooster On Paper" series presents the work of international artists in limited edition books.